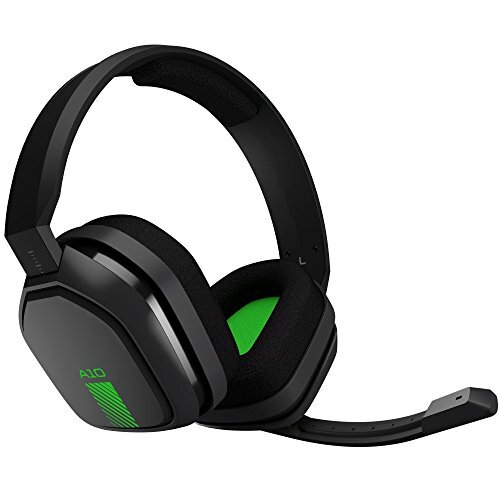 A10 Headset for XB1 - GREY/GREEN - 3.5 MM - WW. The A10 was designed to withstand serious abuse - featuring lightweight yet rugged construction with premium materials for a pressure-free fit that wont overheat your head. The ear cushions feature cloth for maximum comfort, backed with synthetic leather for the best acoustic performance. ASTRO headsets are specifically tuned for gaming. We work closely with developers, pro gamers, and streamers to deliver dialogue, music, and in-game sounds as they were intended to be heard. ASTRO Audio provides a neutral, smooth, and extended frequency spectrum for detailed, true to life imaging. This means non-fatiguing highs, clear mids, and tight distortion-free bass for balanced resolution. Designed for marathon gaming sessions, the A10 Headset also fits comfortably around all VR headsets. The Uni-directional microphone with flip-to-mute functionality means you can communicate with your teammates clearly. In-line Volume adjustment provides more control so youre always in charge of your audio. One headset you can use for just about all your gaming and audio needs.